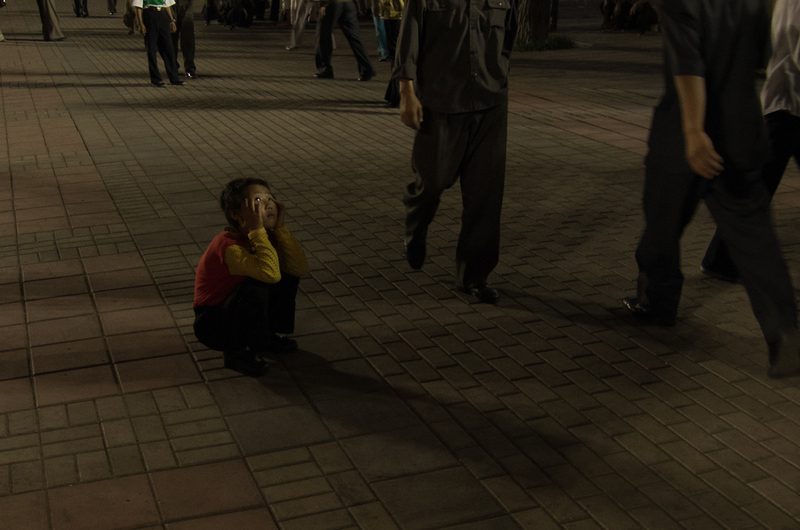 In September my friend and I were fortunate enough to visit North Korea for 9 days as tourists. Having only been exposed to western media, we didn't know what to expect. It ended up being quite the adventure. Some of our preconcived notions were incorrect, while others were painfully true. 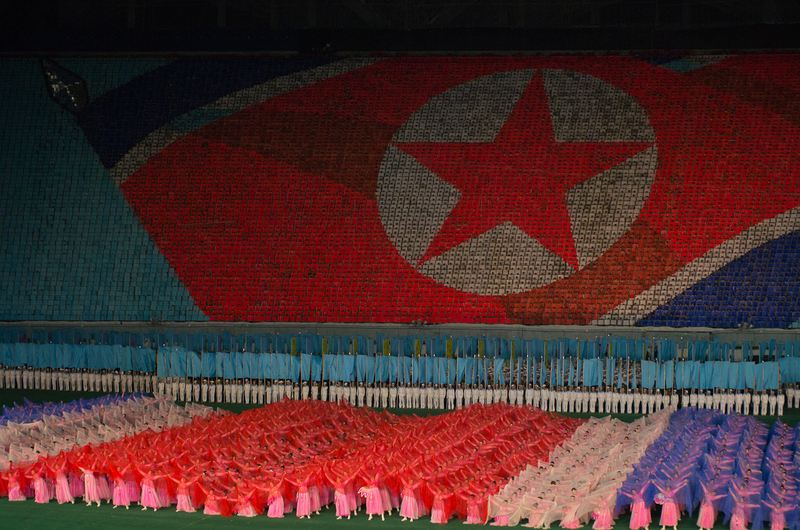 Though it was stressful at times, we have fond memories of North Korea and plan to return. The following photos document our trip there. 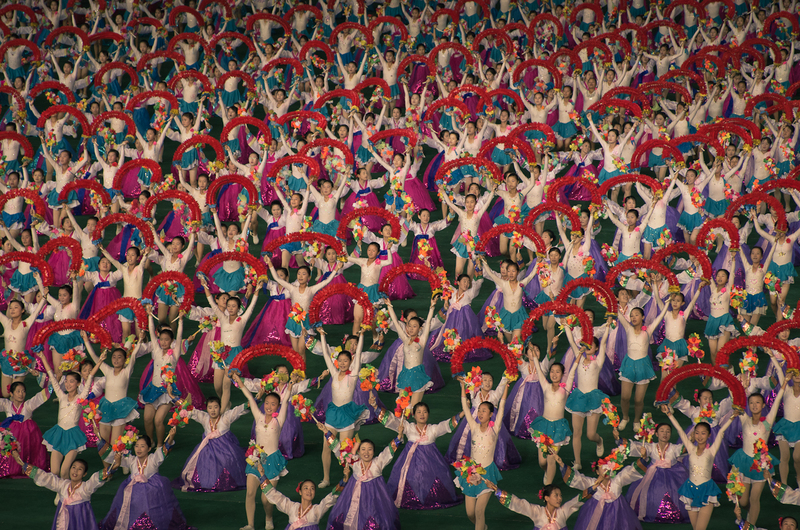 1 Women perform at the Arirang Mass Games in Pyongyang. We were told that there were over 150,000 people performing in the Mass Games, which was more than the number of spectators. 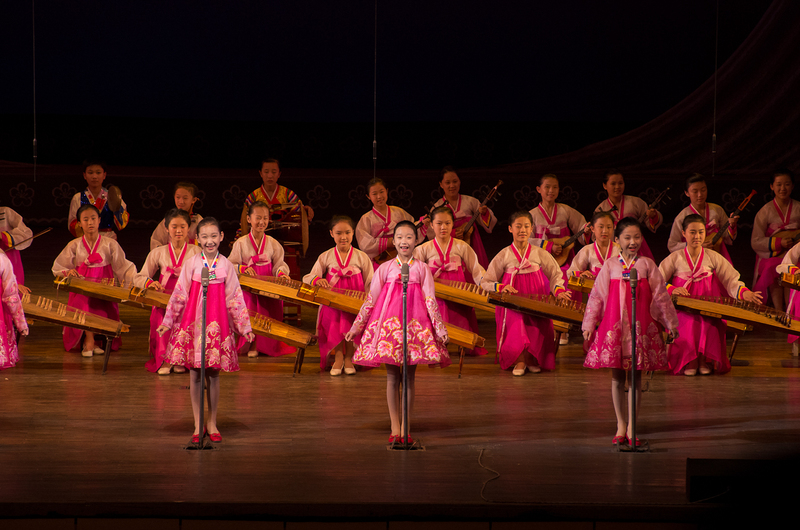 2 The performance was mainly patriotic, going through Korea's history and Kim Il-sung's life. 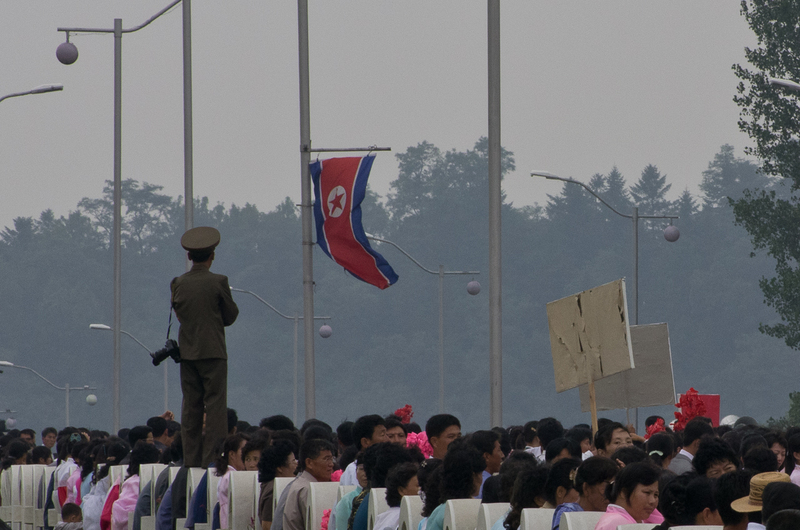 3 The North Korean flag displayed by the "Human LCD". 4 Children warm up before the performance begins. 5 A portrait of Kim Il-sung appears on Kim Chaek University of Technology. 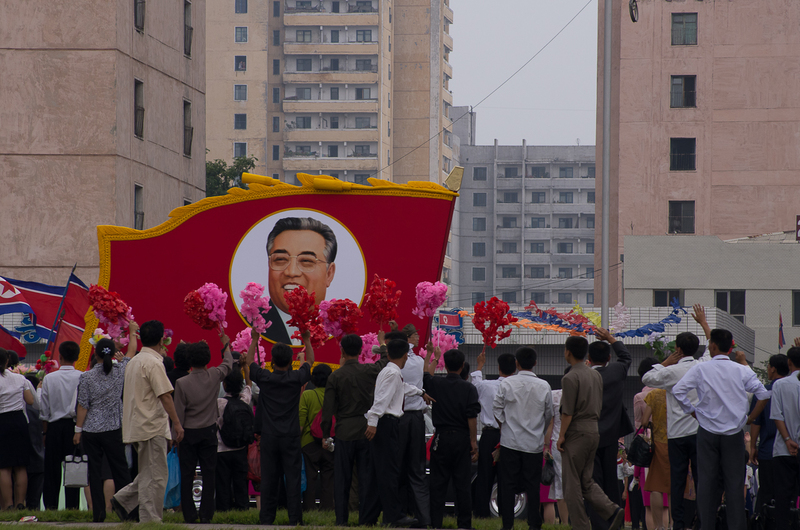 Kim Il-sung's portrait is a very common sight in North Korea. Many rooms had portraits of him and his son, Kim Jong-il. 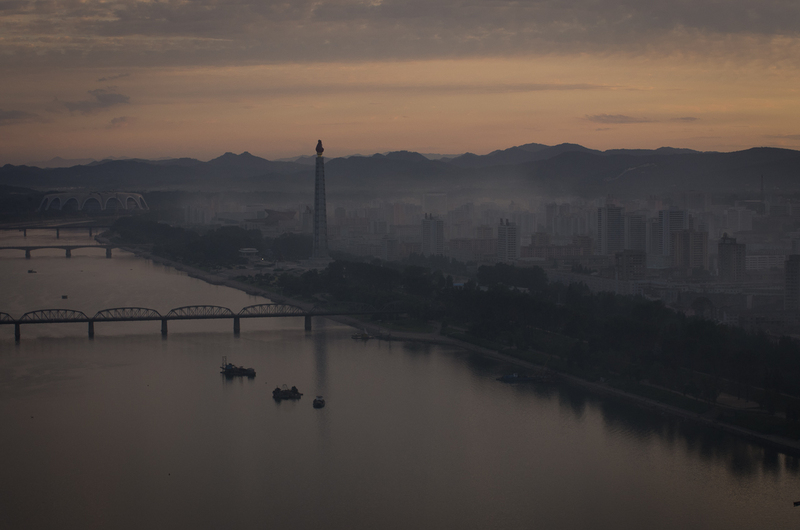 6 Pyongyang as seen in the morning. The building at the top left is May Day Stadium, which is where the mass games are performed. Our guides said it was designed to resemble a parachute. 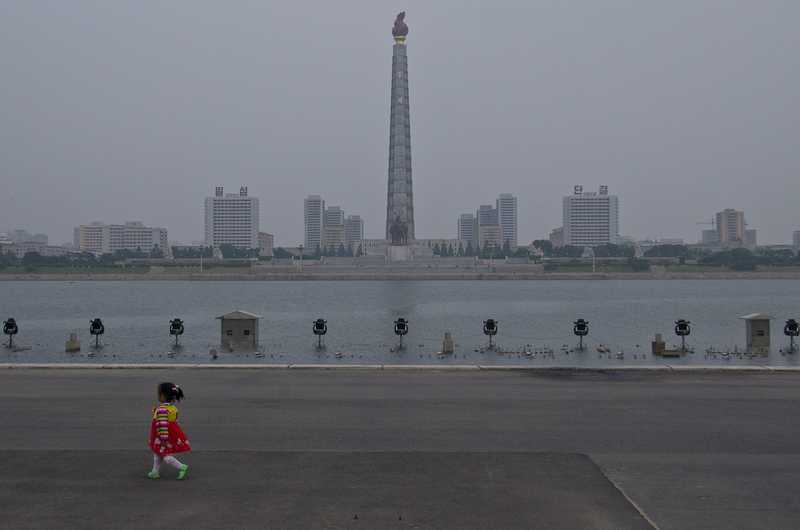 The tower in the center is Juche Tower. 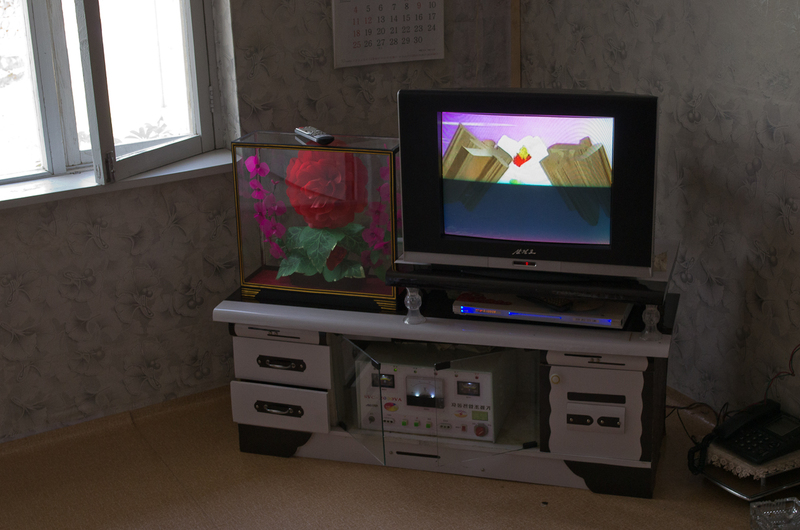 It is named after Kim Il-sung's principle of Juche, which emphasizes self reliance. 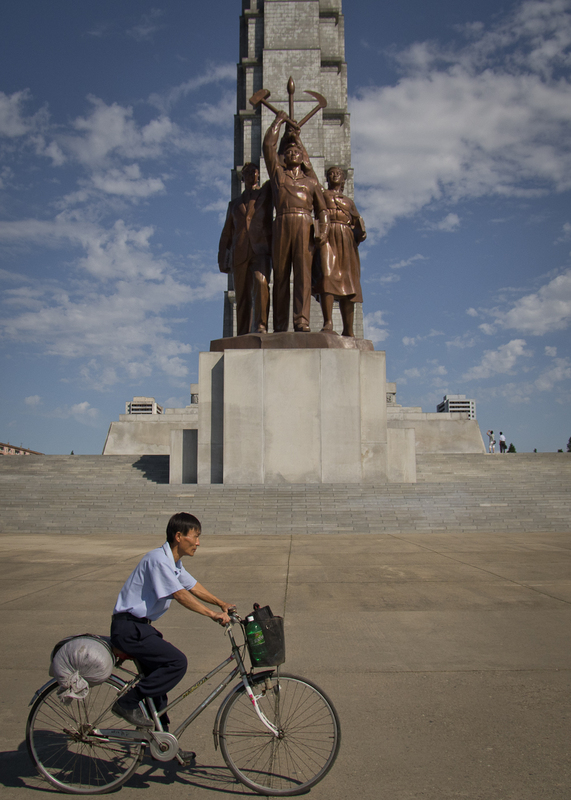 7 A man cycles past Juche Tower in Pyongyang. The local guide here was fairly interesting as she was fluent in English and Russian. Her English was better than our guides (and probably mine). After talking about the tower she seemed quite interested in my girlfriend and I, asking questions about Canada. 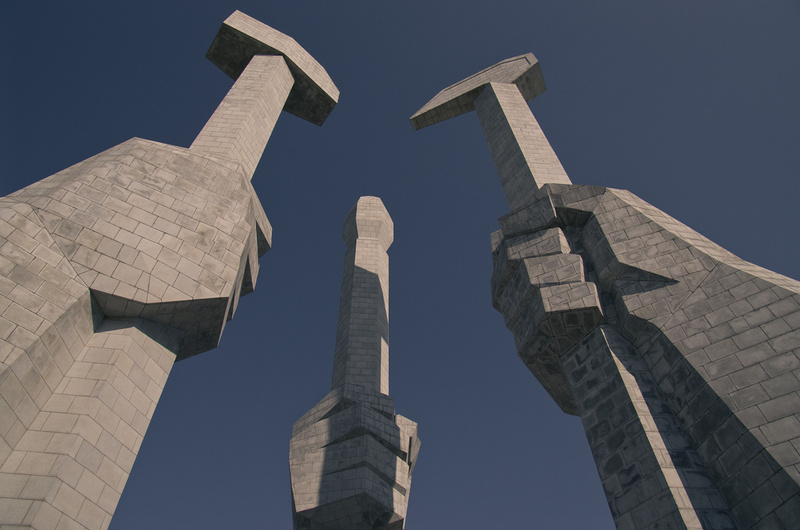 8 Monument to Worker's Party Foundation. The brush represents the working intellectual, while the hammer and sickle represent industrial and agricultural workers. 9 The local guide waits at the Monument to Worker's Party Foundation. 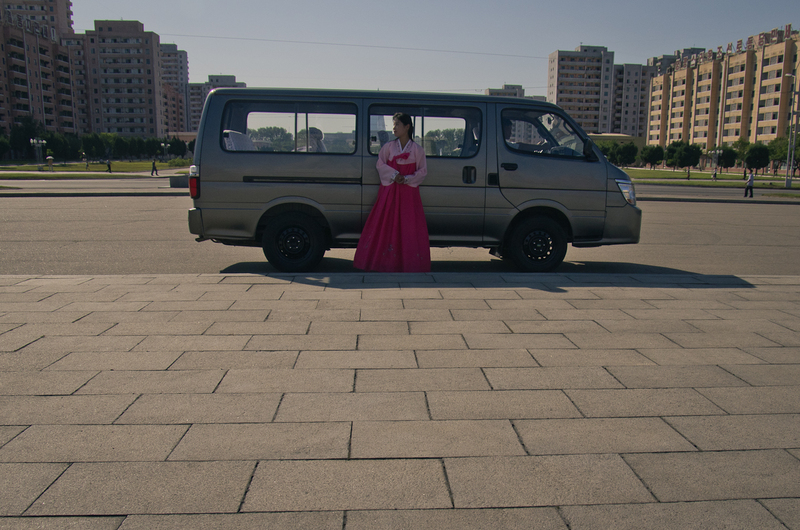 She is wearing a traditional dress called a Chosŏn-ot which a very typical sight in Pyongyang especially during holidays. 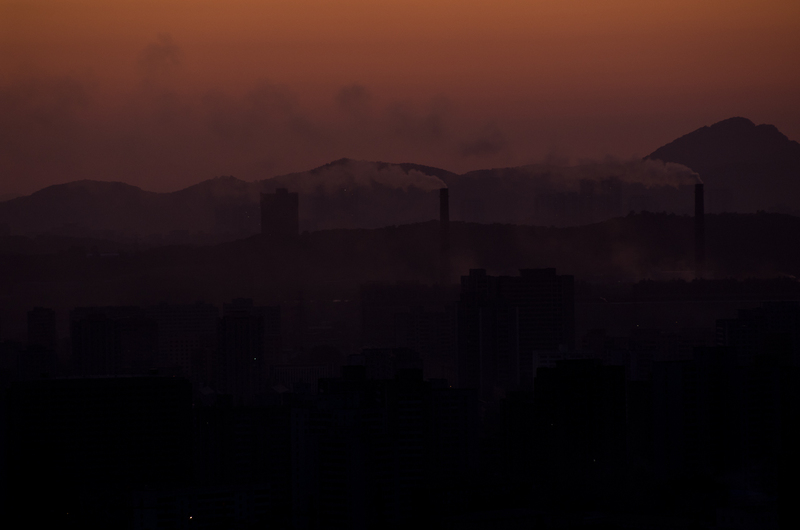 10 Smoke stacks from coal power plants in Pyongyang. 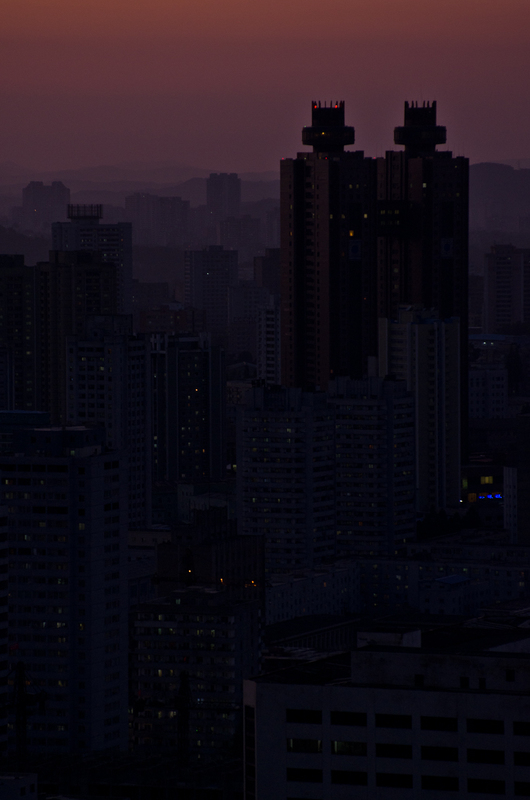 Since North Korea has power problems, the city is very dark at night, with minimal lighting. We were able to peer into a few apartments while driving through the city one night, they were mostly lit with a single florencent blulb. 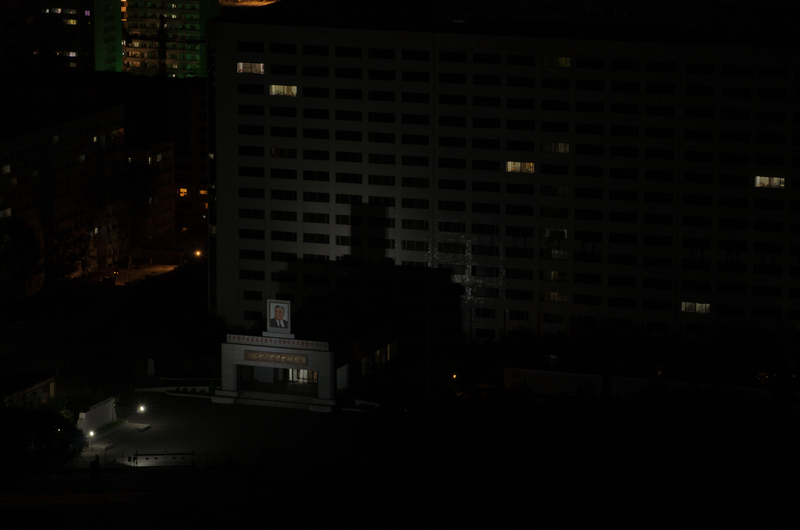 11 Koryo Hotel in Pyongyang. 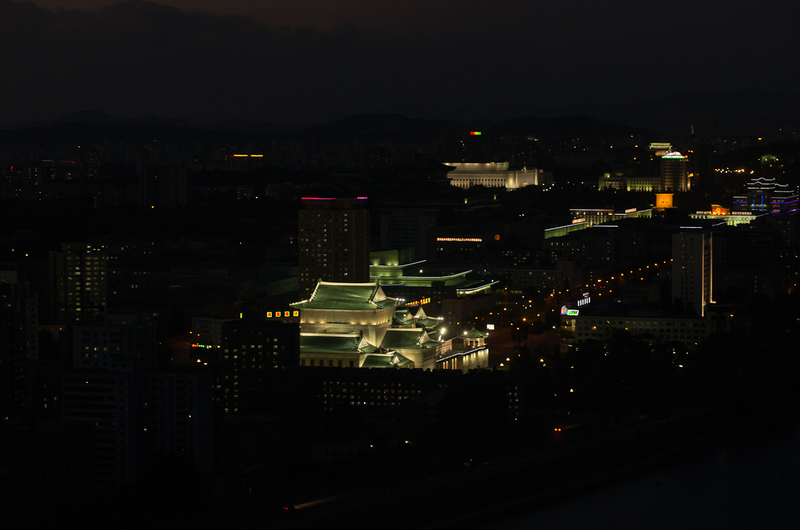 This hotel along with with Yanggakdo hotel are the main hotels where foreigners stay while visiting Pyongyang. 12 Here you can really see the contrast between how the monuments are lit compared the rest of the city. The building in the foreground is the Grand People's Study House. 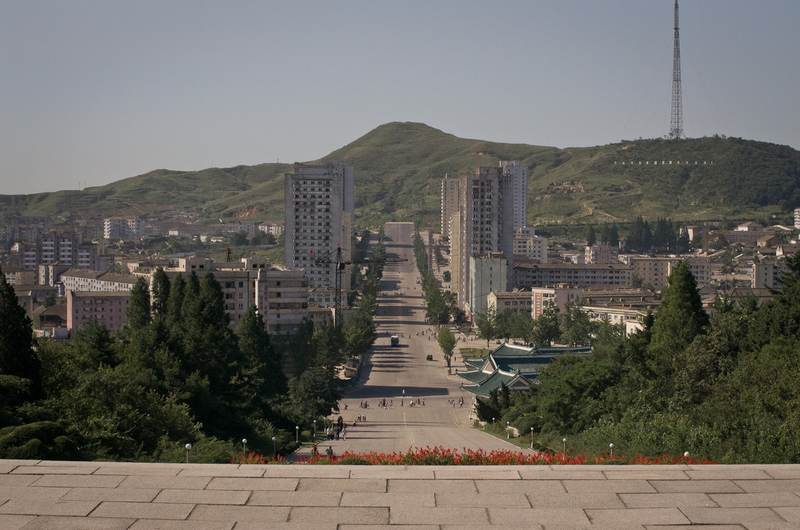 13 Kaesong is a small city just to the north of the DMZ. 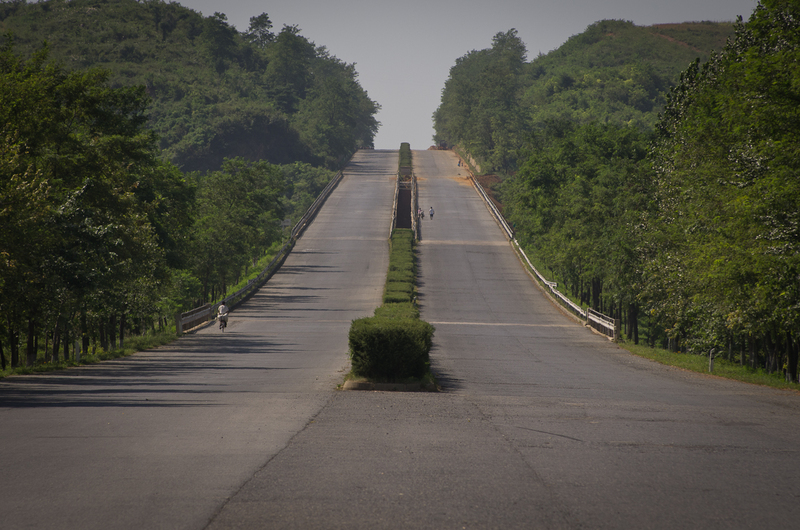 Pyongyang to the right, DMZ to the left. In the first intersection you can see a traffic cop directing traffic. 14 Ginseng products at the small gift shop at near entrance at the DMZ. DMZ stands for demilitarized zone, which is somewhat ironic as it most militarized border in the world. 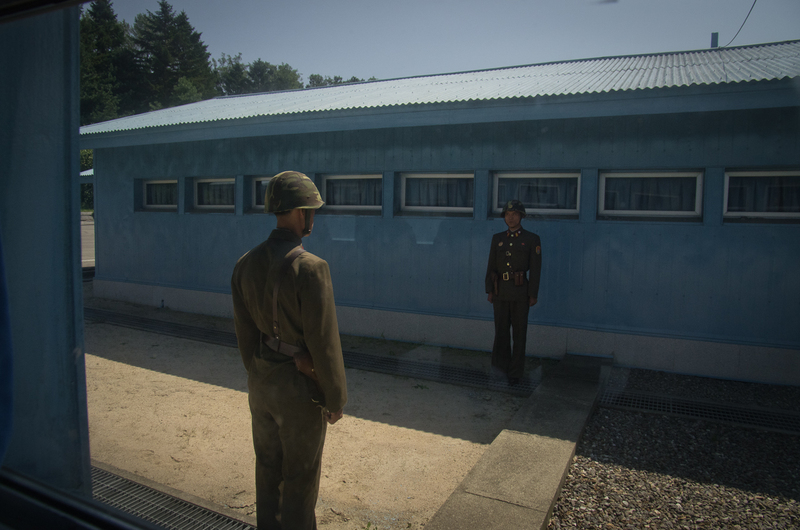 15 Soldiers explain the armistice agreement at the DMZ. 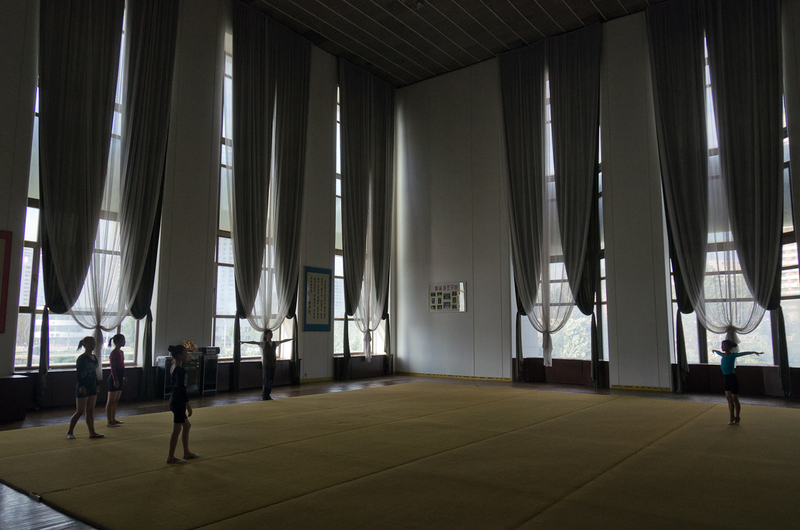 This is the room where Armistice Agreement was signed July 27th 1953. Since it was an armistice agreement, the North and South are technically still at war. This room also houses the axe used in the axe murder incident in 1979. 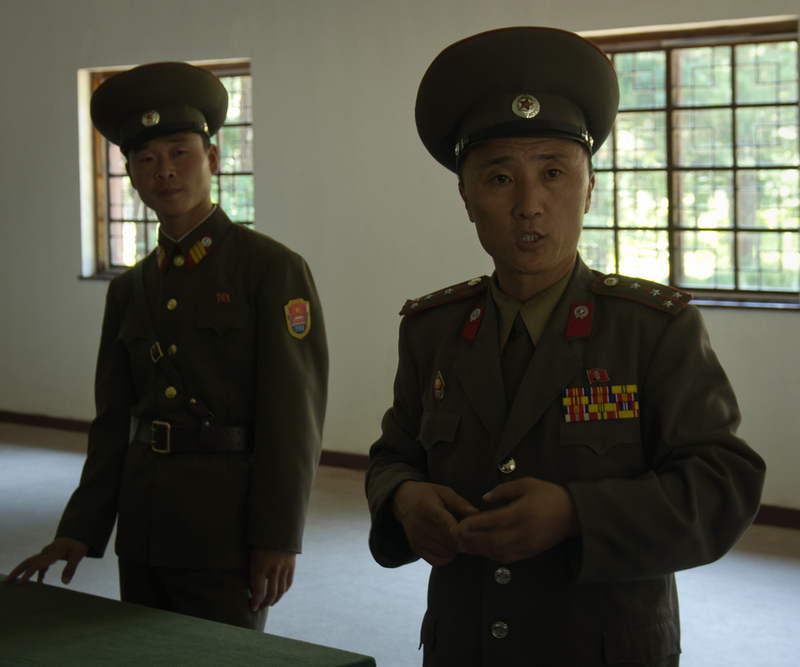 One of the guides insisted American soldiers used it to kill North Korean soldiers. 16 North Korean soldiers stand on the border at the DMZ. The story is that they stand this way so they can watch each other in case one decides to run. 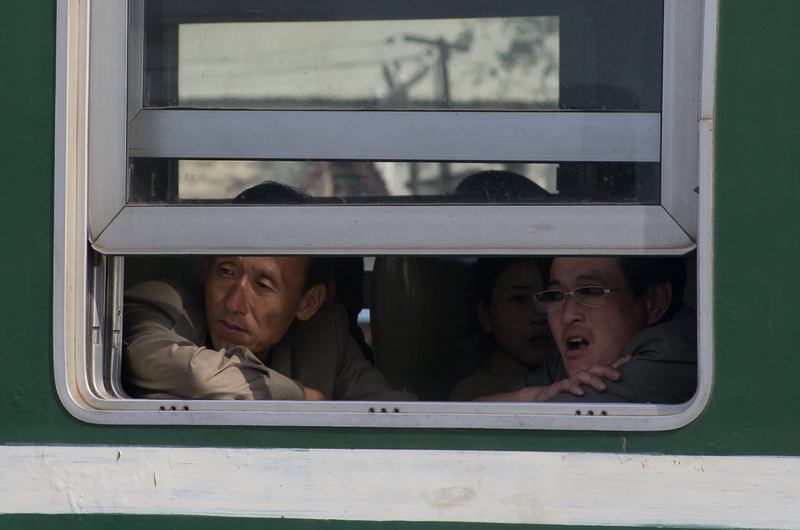 17 The road from Pyongyang to the DMZ. There were very few vehicles on the road, with most of the traffic being pedestrians and cyclists. 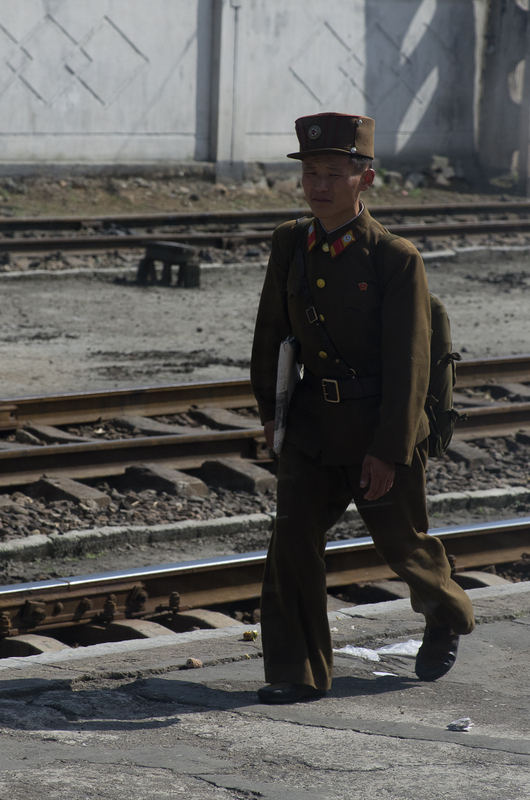 We had many close calls with pedestrians and cyclists as cars are a relatively new thing in North Korea. The road was unusually straight, we went straight through mountains instead of around. The road also featured large concrete blocks which could be knocked onto the road in case of invasion. 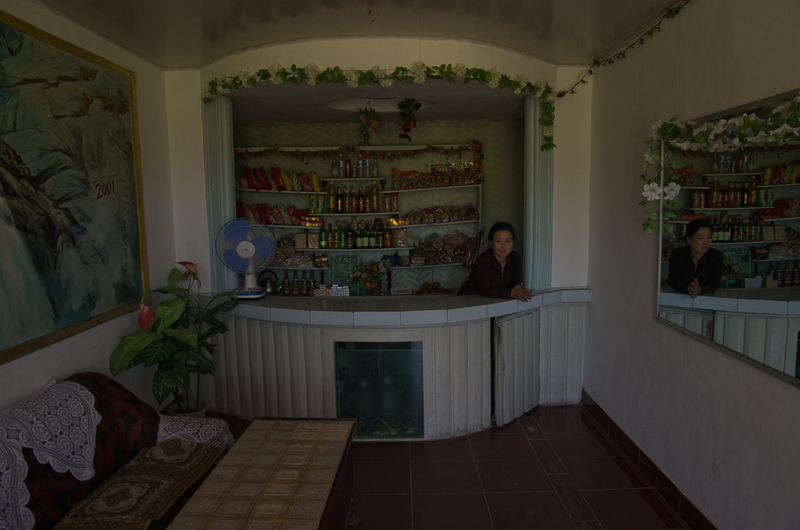 18 A man sits at the rest house between Pyongyang and the DMZ. 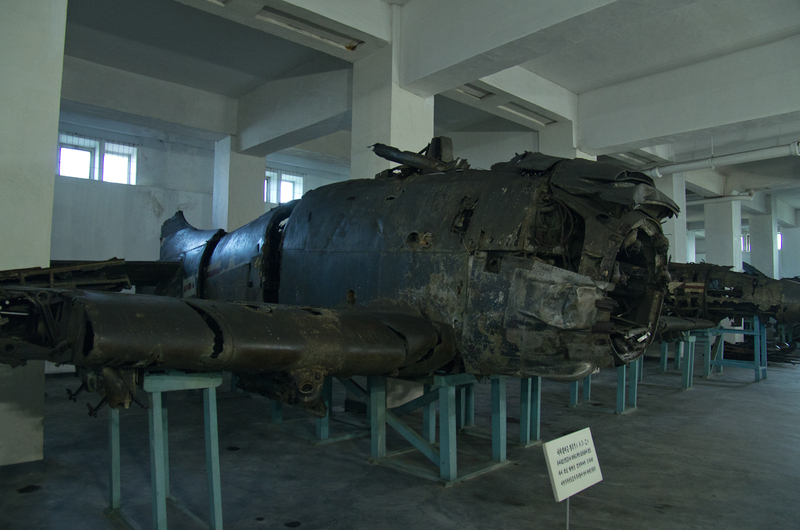 19 A destroyed AD-2 Skyraider at the Victorious Fatherland Liberation War Museum used during the Korean war. This was very interesting as most of the American equipment had been destroyed during battle. Conversely at the War Memorial of Korea in Seoul, all the equipment is in pristine condition. 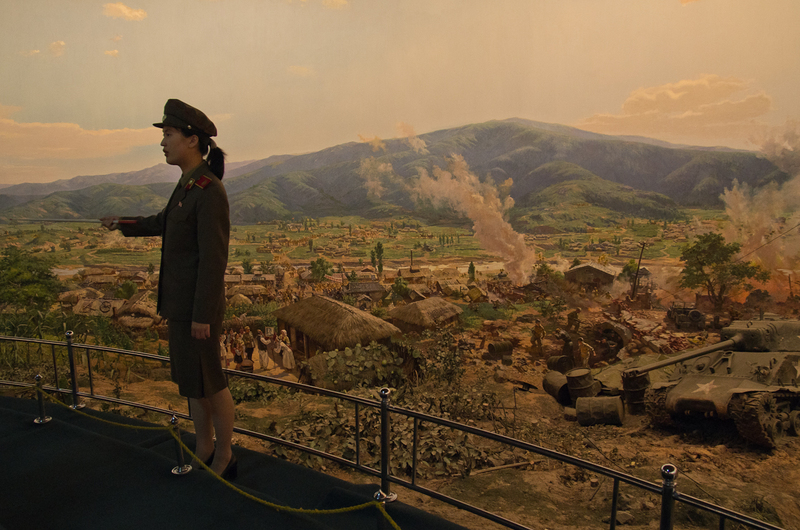 20 This painting featured the Battle of Taejon. It is 360 degree painting blended in with real props. The stage in the center slowly rotates around allowing you to view the painting while sitting. 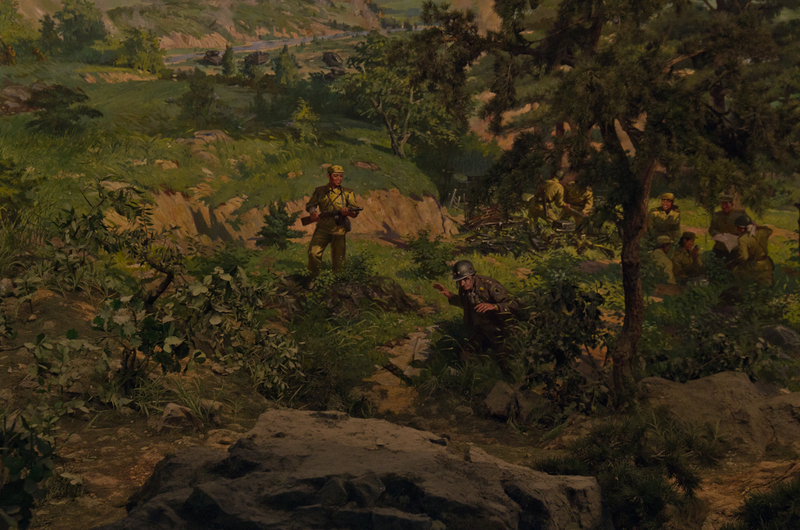 21 A cowering American soldier featured in the painting. 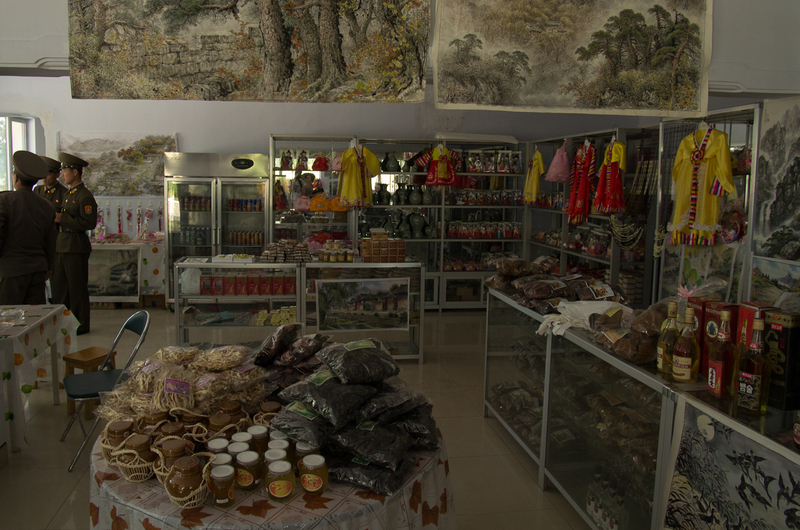 22 This is a store at a coop farm outside Wonsan in North Korea. We bought some candy for the children we were about to see. 23 The whole interaction with the kids was slightly setup. They knew we were coming, and as we walked into the courtyard, the children were already singing with the teachers playing the accordion. 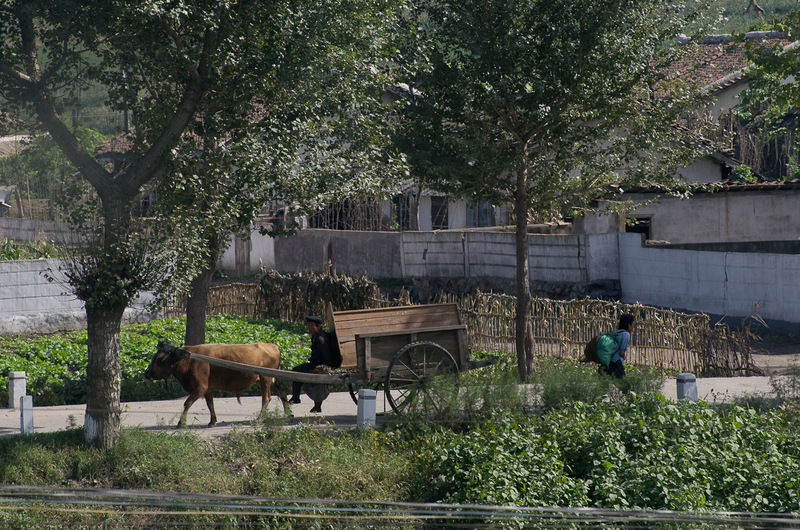 24 We visited a second Coop farm outside of Hamhung which is a few hours north of Wonsan. The children also performed a song for us here. We were told that school is mandatory for children. This clearly wasn't true as you can see children of the same age walking on the street with large bags of rice or corn. 25 We were able to visit one of the homes at the farm. This was the entertainment setup. 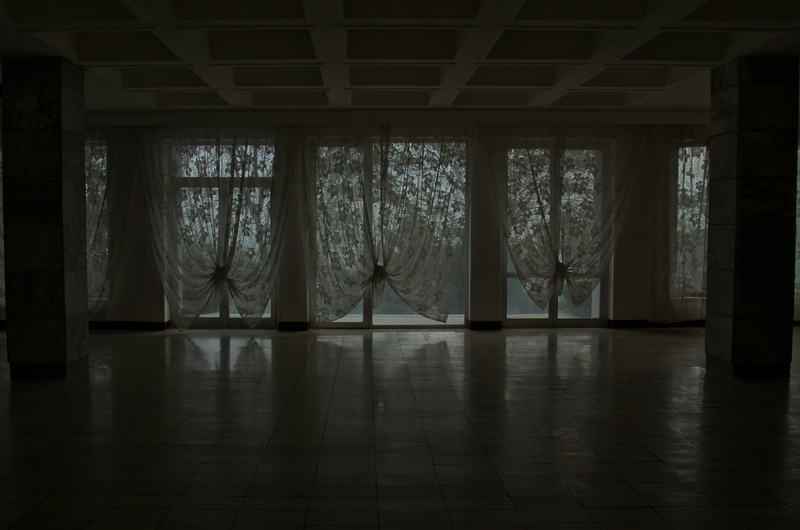 The room, otherwise empty, also had portraits of Kim Jong-il and his Dad, Kim Il-sung. 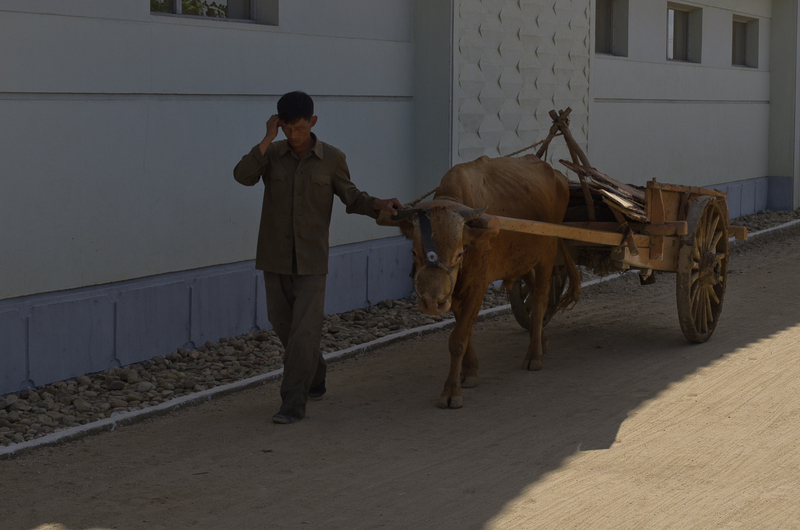 26 The ox and cart is a very common in North Korea. I was really surprised the first time I saw it. 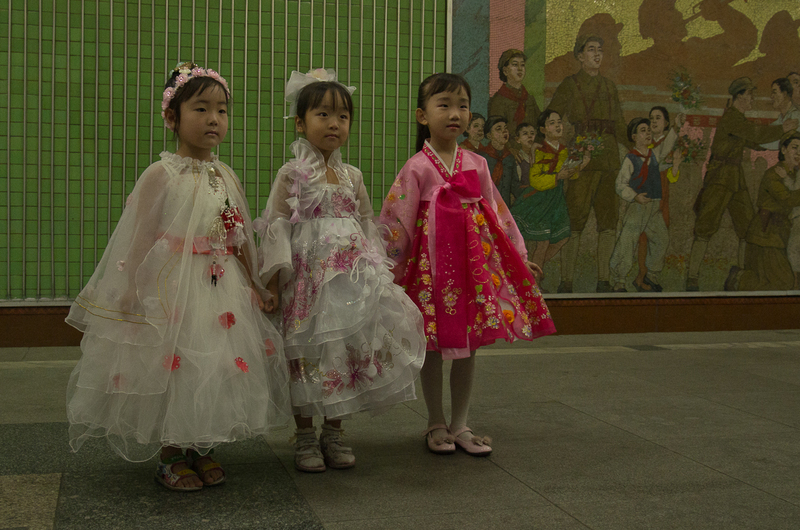 Visiting North Korea is like taking a time machine in many ways. I didn't get any pictures, but on the east coast we saw a lot of trucks that had been converted to run on wood gas. They appeared to be very unreliable. 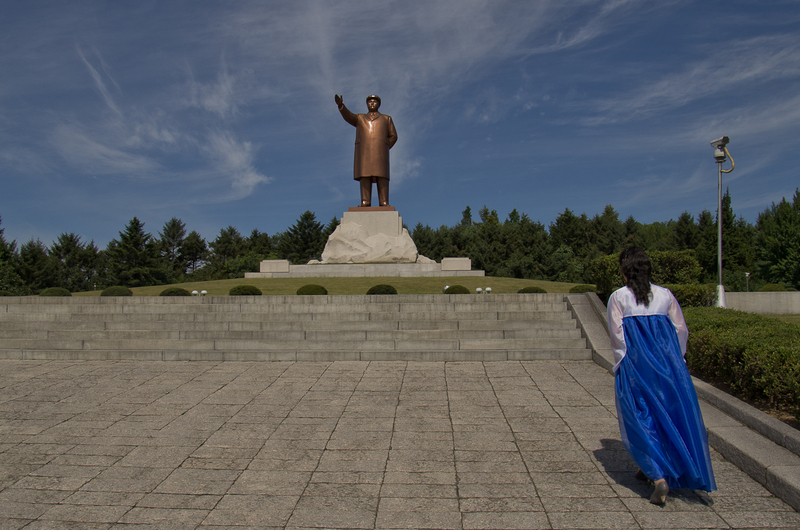 27 The local guide leads us to a statue of Kim Il-sung in Hamhung. All the big cities have some sort of monument to him and we were often asked to bow at them. 28 The lobby at Majon Beach Hotel in Hamhung. A lot of buildings had little in the way of furnishings. This hotel also lacked running water. 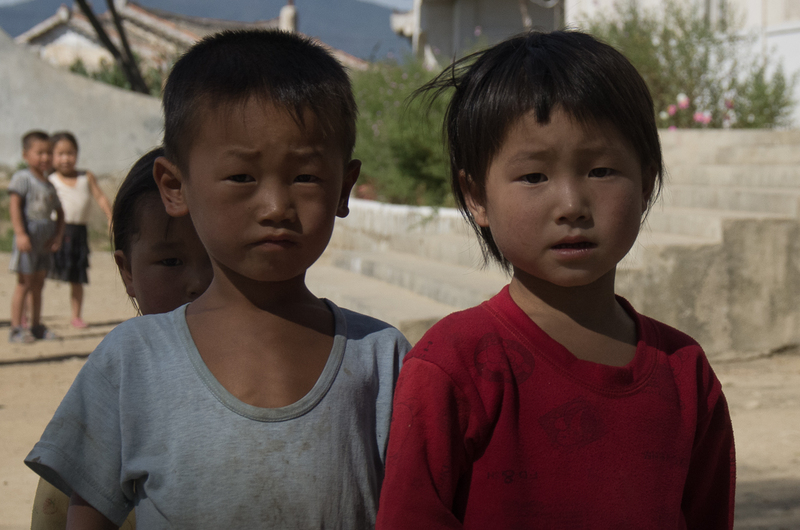 In fact all of Hamhung didn't seem to have running water despite there being toilets and sinks etc. 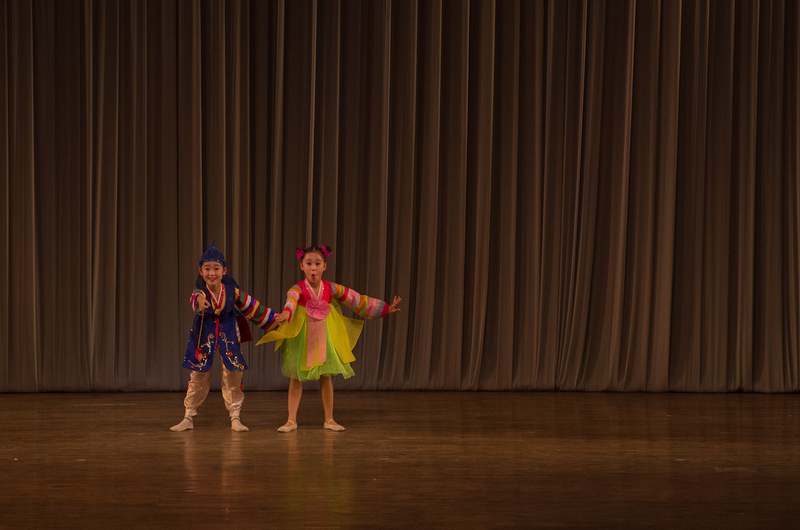 29 Children perform at Mangyongdae Children's Palace in Pyongyang. Mangyongdae Children's Palace is a place where children can go for extracurricular activities. 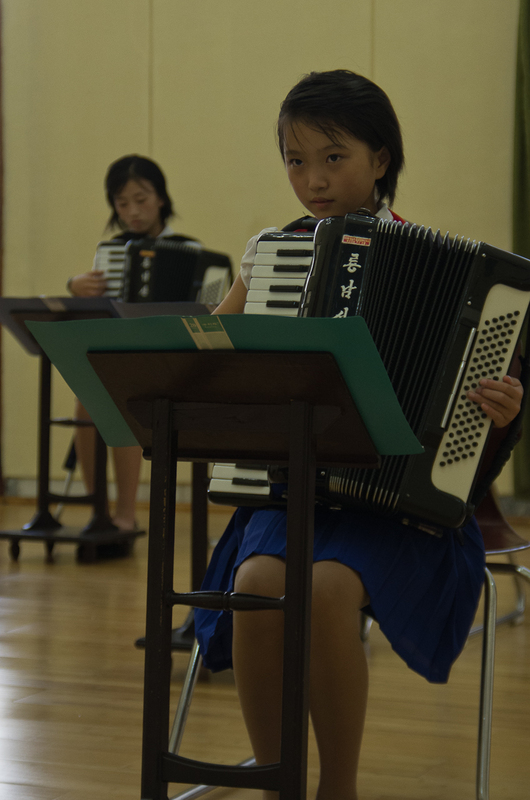 30 A girl plays the accordion at Mangyongdae Children's Palace. All the students here are extremely talented and disciplined. 31 Choir practice. 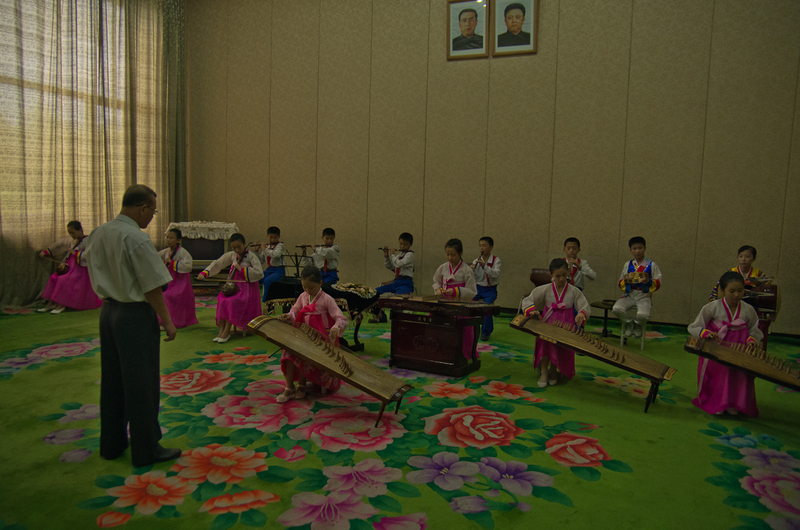 Although impressive, the experience was a bit awkward as we were paraded from room to room to see the students perform. It was definitely tourist day and there must have been a few hundred of us coming through. Some of the kids definitely didn't look too comfortable with us coming through. 32 This one was a bit more interesting. It was less of a show and more of a class. The teacher would stop the kids and make corrections to certain students. Most of the other classes were more of a performance for the tourists coming through. The large lap instrument is called a Kayagum. 33 Girls practicing Rhythmic Gymnastics. The building was really impressive, high ceilings and tall windows. 34 They also have a 2000 seat theater in the school. Here we got an hour long performance by the kids. This is where we got to see the best of the best. I have to say the whole thing was extremely impressive. These kids are ridiculously talented. This is not something you could ever see in the west. 36 Some video of the performance. 37 During one of the evenings, they took us to the "fun fair". It was an amusement park that definitely held its own with a rollercoaster, bumper cars, arcade and various other western rides. This child was watching a ride which we call the "Hellevator" here in Vancouver; a vertical ride that accelerates you up and down a tower. 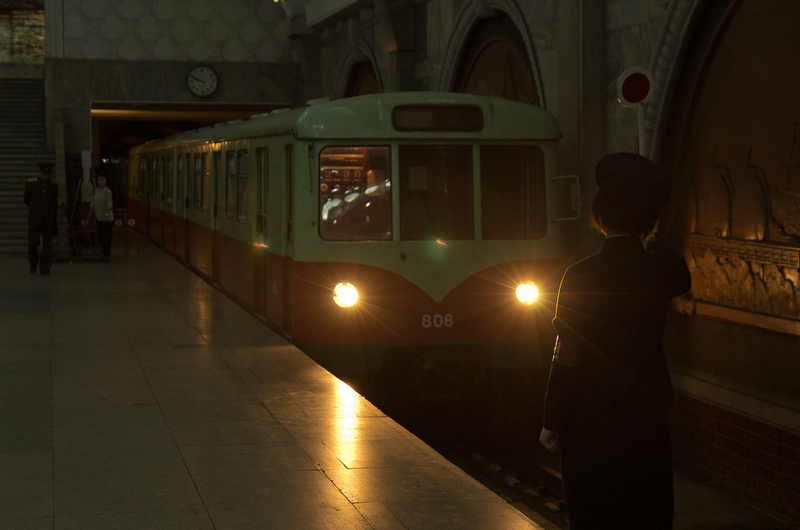 38 Our guides took us on the Pyongyang metro where we took a ride through 5 different stations, all of which were very elaborate. Apparently the other stations are very rudimentary. 39 Since it was National day a lot of the locals were dressed up in their best. We saw these girls and had to take a photo. 40 Passengers at Kaeson station. 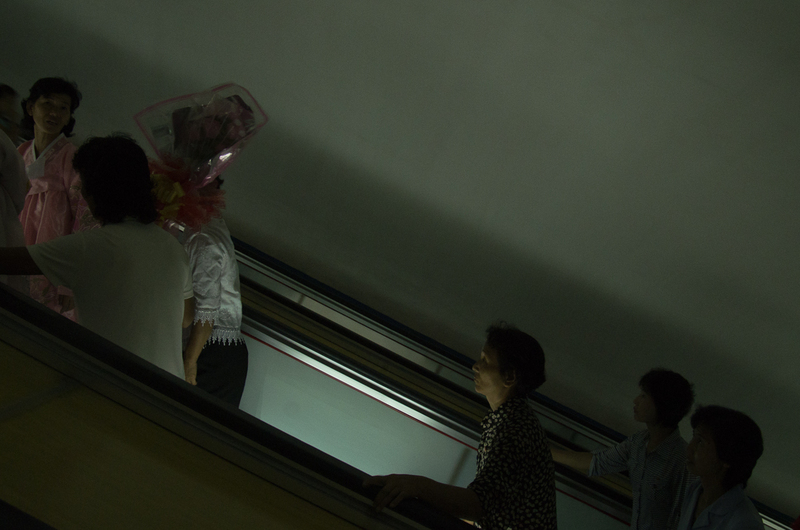 41 The metro is the deepest in the world at 110 meters. It was constructed at such a depth so it can serve as a bomb shelter if necessary. 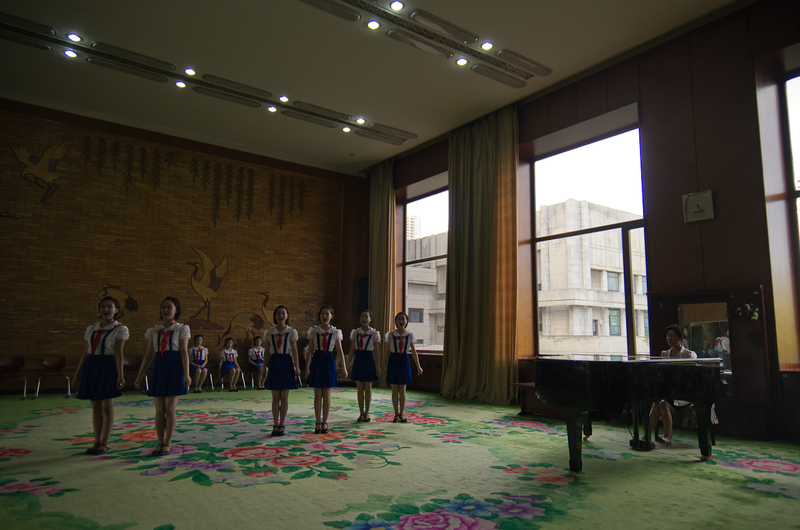 42 Mansudae Art Studio in Pyongyang. 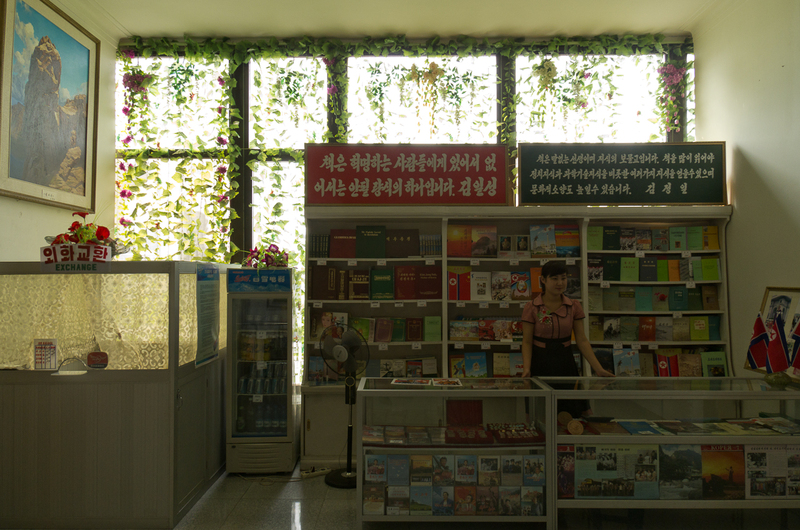 We were able to buy propaganda posters and North Korean currency here. 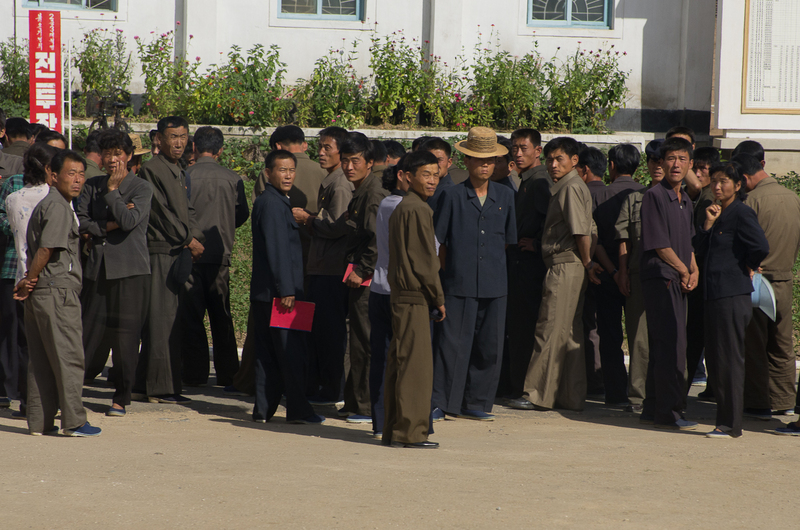 Earlier we tried to exchange Euros for North Korean currency with our guides, but they refused. 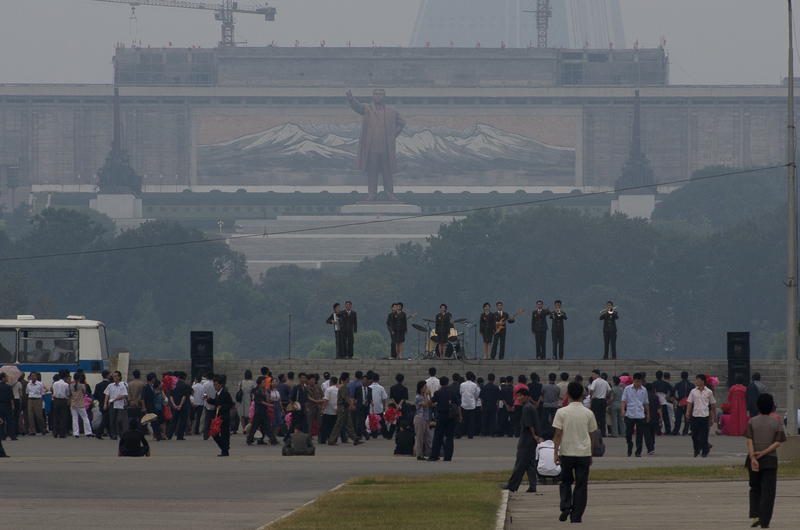 43 A Band playing in Pyongyang for National Day. We asked our guides if we could go see the band. Reply: "They are not an official band." 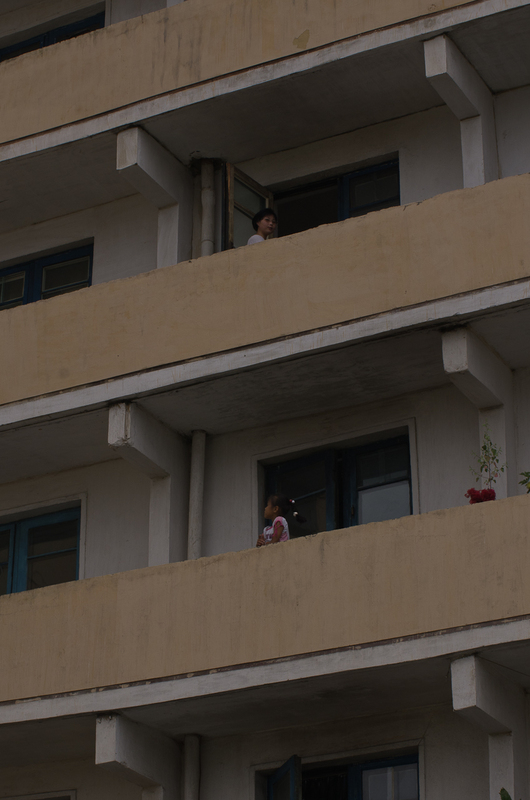 44 Apartment balconies in Pyongyang. 45 We were lucky enough to see the military parade for National day. 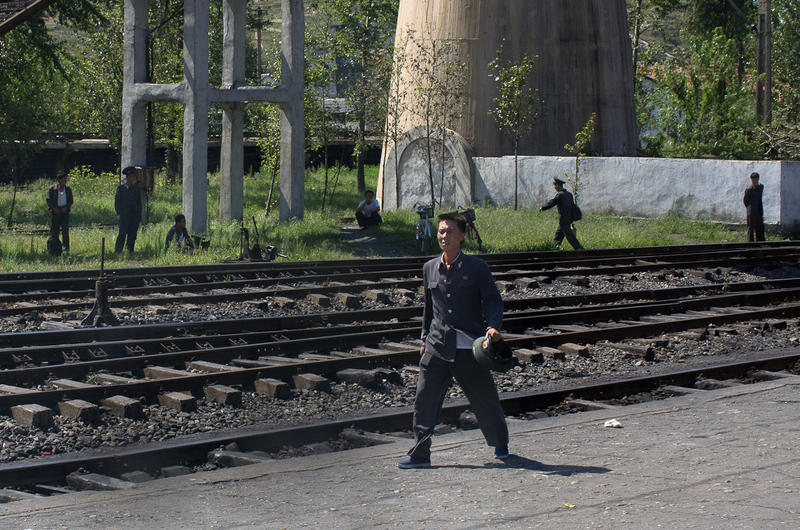 In this photo, Kim Il-sung's portrait drives past on a car. 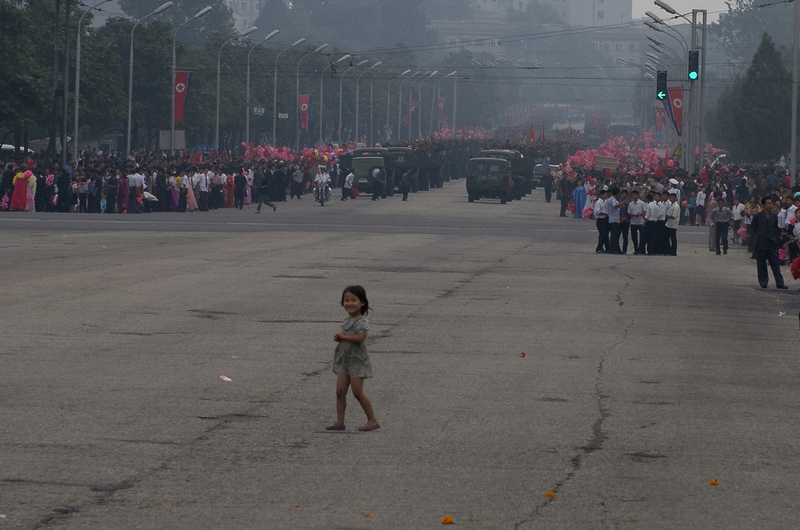 Kim Jong-il and his son Kim Jong-un were watching the same parade. 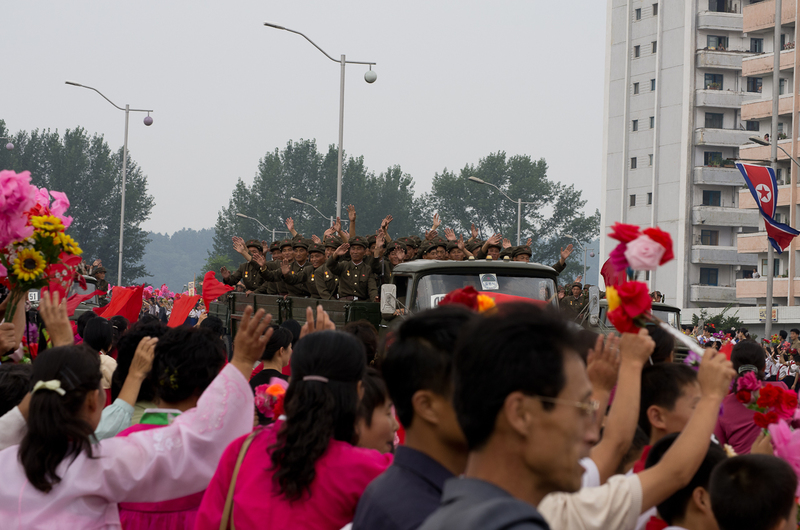 46 Soldiers ride past in a Korean war era truck during the military parade. 47 The parade was pretty amazing. It was surreal to see 50 year old equipment, still in service, roll past. We would later goto the war museum in Seoul and see the same equipment on display. 48 A girl walks into the street after the parade passes. 49 A military photographer waits for the next wave of the parade to come past. It turns out we were very lucky to see this parade. We talked to other tourists and we were told they were not allowed to see it. We may have been rewarded for good behavior earlier in the trip. 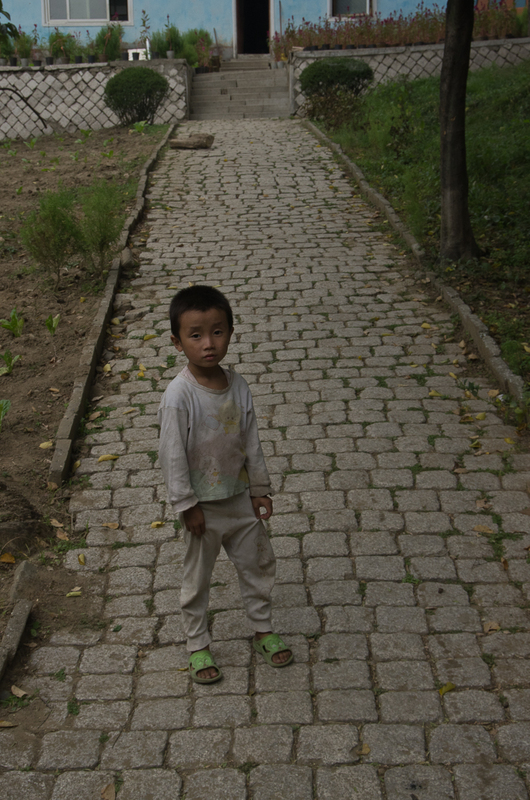 50 A boy in Moranbong Park. 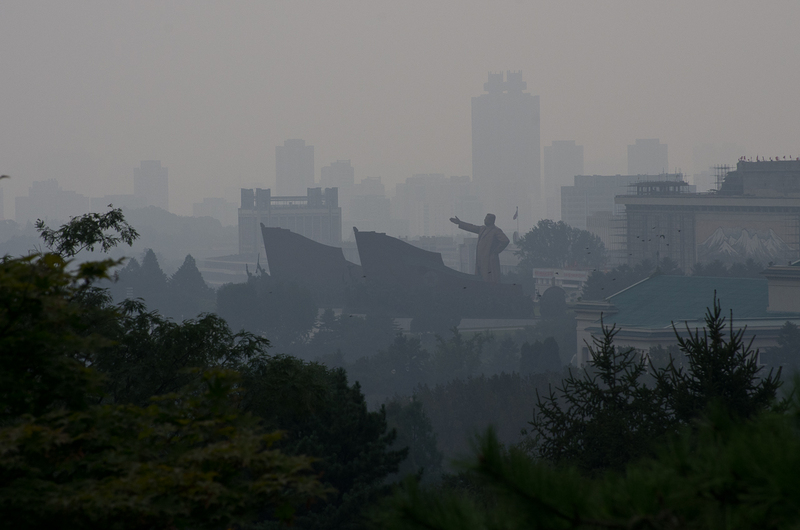 51 Statue of Kim Il-sung as seen from Moranbong Park. 52 A lot of the singing and dancing at the park was most likely setup. We spoke to some Dutch tourists on our trip they mentioned that the people all of a sudden started dancing and singing when they noticed them. Plus you can find other videos on Youtube of the same situation in the same park. 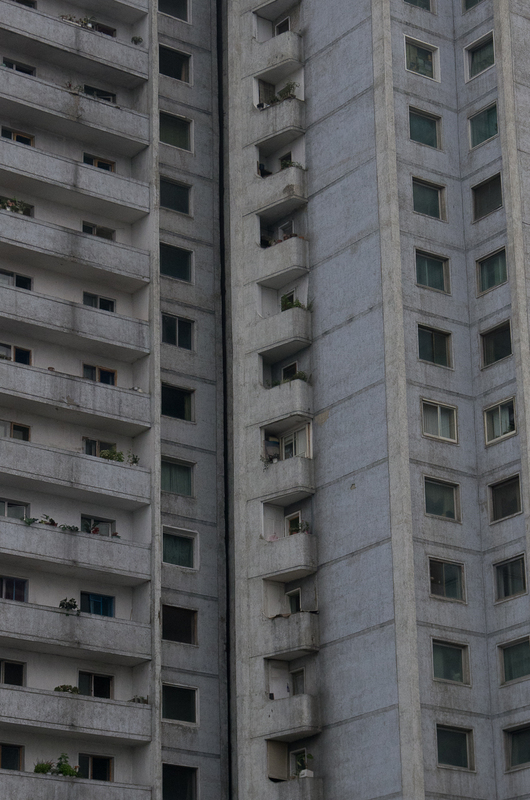 53 A typical apartment complex in Pyongyang. 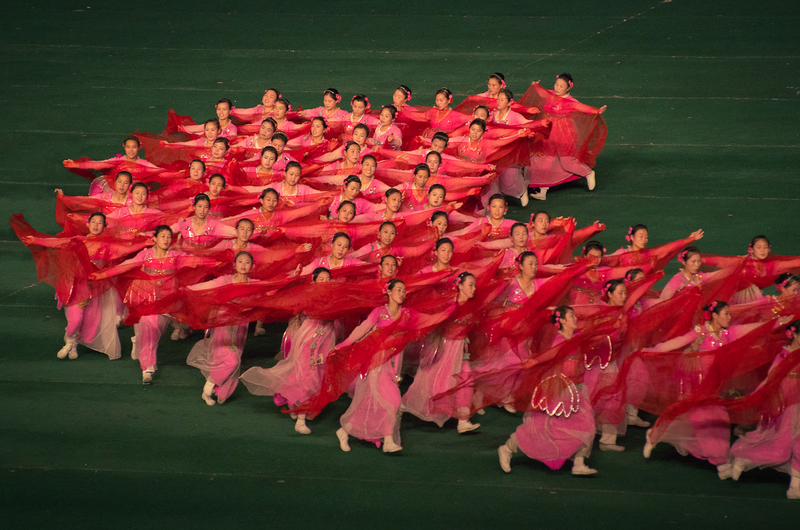 55 Mass Dance in Pyongyang. Our guides really wanted us to join the dance, eventually we agreed. It was really awkward not knowing any of the steps, but still fun. 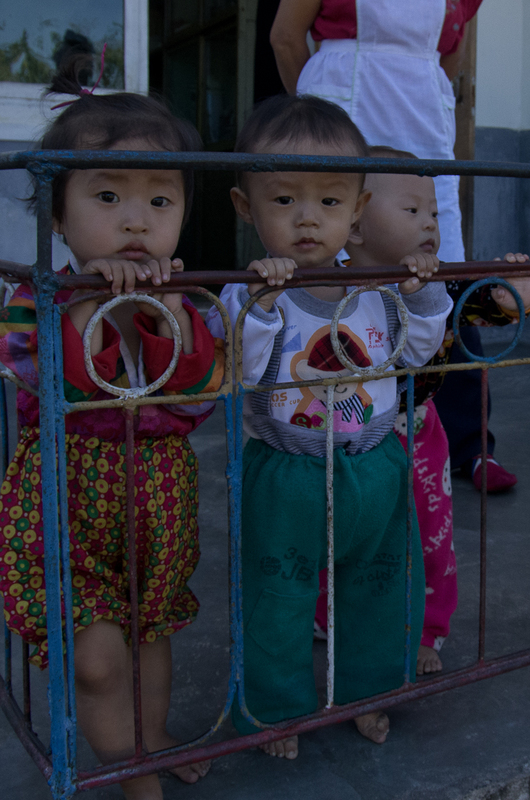 One of the few opportunities to interact with North Koreans. 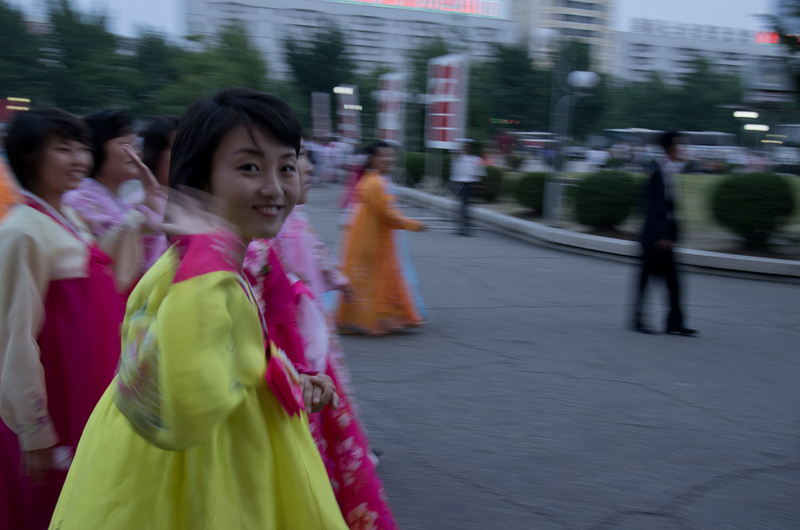 56 A Korean woman waves after the mass dance. 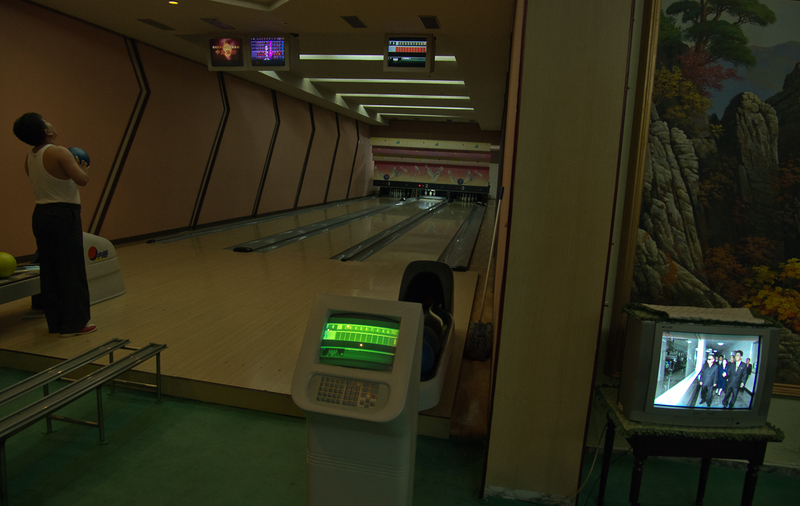 57 A man bowls as Kim Jong-il can be seen on North Korean TV. Kim Jong-il was quite prominent on the state channel. However the hotel did have Chinese, Russian and Japanese television. 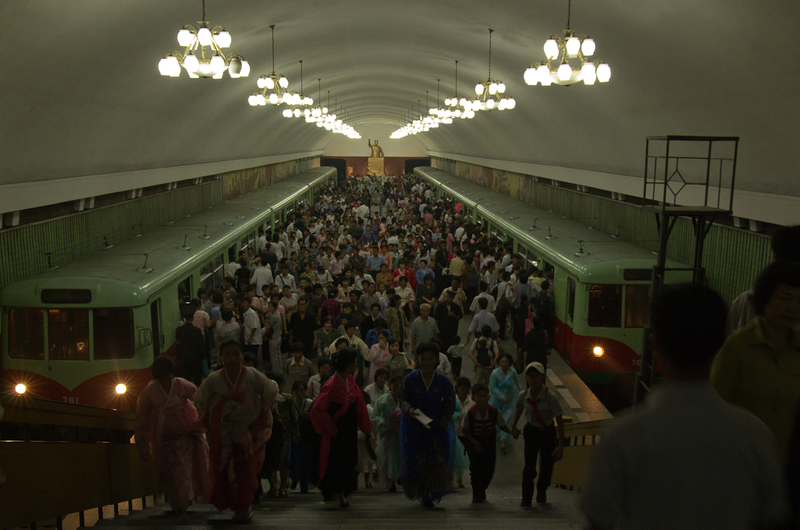 58 We took the train to leave North Korea back into China. At this point the guides were not with us and we were able to shoot many pictures. 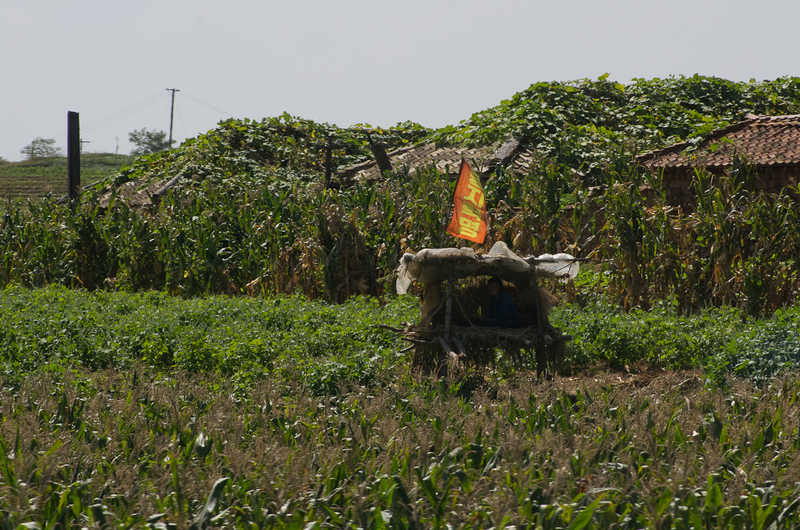 Here a woman sits in a loft in the corn field. 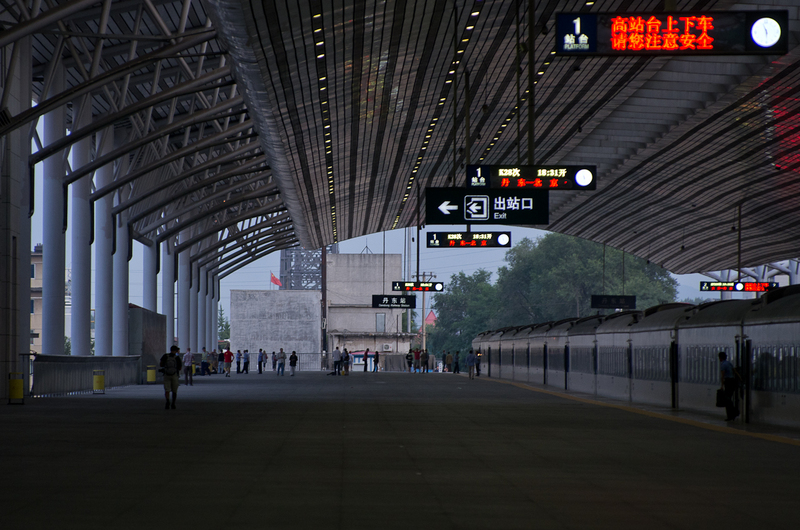 59 We stopped at various stations on the way out; all of which were quite interesting. 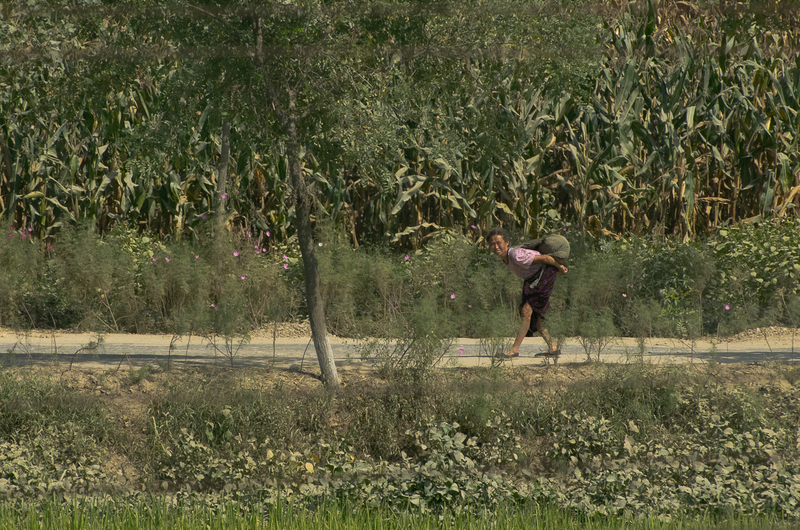 60 A woman walks along a road. 61 Yet another ox and cart. 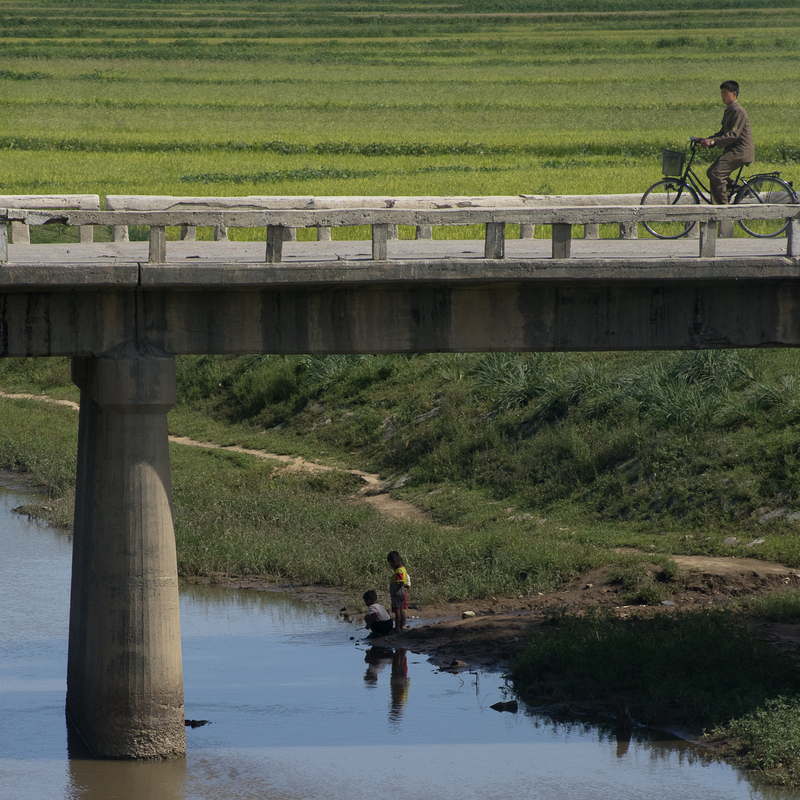 62 Children play as a man cycles over a bridge. 63 We stopped at a station with another train waiting. The passengers were just as interested in us as we were in them. 64 A family peers out over the window sill. 65 People who were affected by the famine in the 90's really stand out. There is a certain age group that is a head shorter than everybody else. 66 Laborers halt work for a moment to look at the passing train. 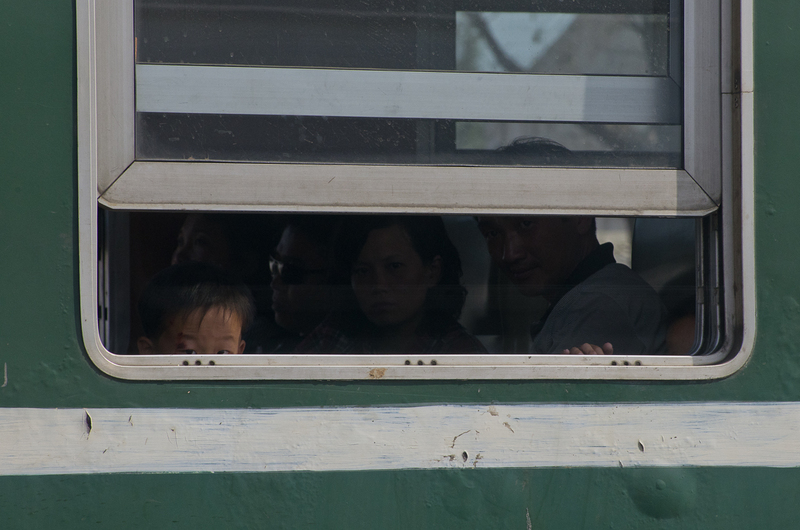 67 A group of Koreans watch the train pass. 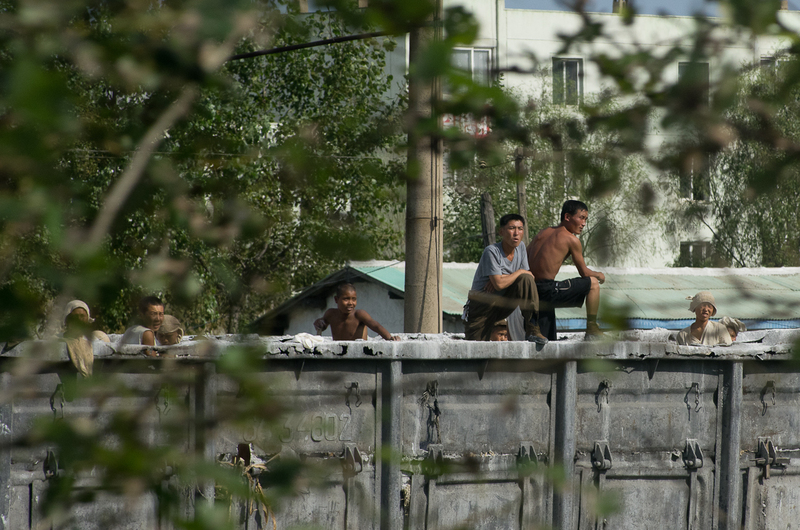 68 Dan Dong, China, just across the Yalu River from North Korea. Back to the modern world, mostly.